As promised here is the “gleam”. As the sun sets the people at Foster Botanical Gardens light over 2,500 lanterns along the garden paths for a nice enchanted forest walk. They even had a “haunted” area for kids complete with witches and smoking cauldrons. 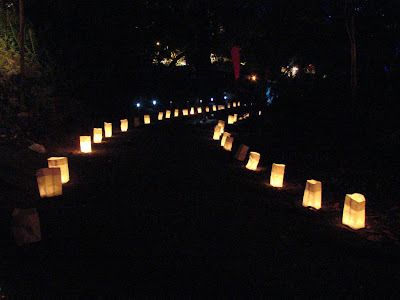 Its very nice to be able to walk the grounds with all the nice lanterns leading the way. All in all a great event for families especially with the free admission price. Be sure to check it out next summer (in mid July) and go early so you can also stroll the grounds and participate in the earlier events. We leave the Big Island to take a moment to catch up on some more recent photographs but don’t fear we will return to the Big Island next week. Here is a photo shot at one of the display tables during the “Midsummer Night’s Gleam” at Foster Botanical Gardens. This annual free event has attractions for kids such as games, magic, arts, crafts, as well as displays and interactive demonstrations. 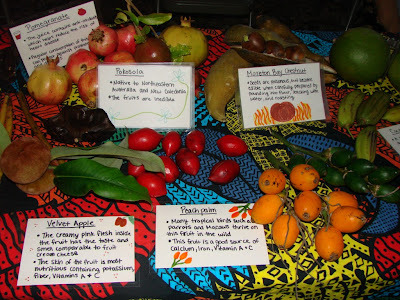 This table showcased many of the fruits and plants that are commonly found in Hawaii. Tomorrow we will show you the “gleam part” of the night. 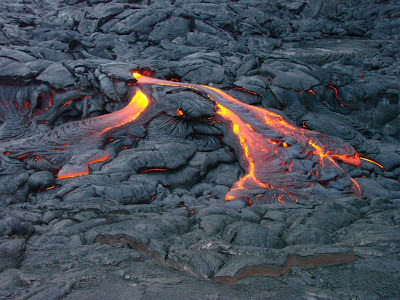 We end lava week with another closeup of the lava flow from Kilauea Volcano through the Kalapana area. As you can see lava will take the path of least resistance going around obstacles and sometimes missing entire houses. I hope you enjoyed lava week of course more Volcano photos including the Halema’uma’u vent and Thurston lava tubes.